Salvia mystic spires growing shrub of the genus Salvia also known as Salvia Mystic Spires Blue, Salvia mystic spires perennial evergreen used as ornamental plant, attract pollinators, fragrant and drought tolerant plant, can grow in subtropics, mediterranean or tropics climate and growing in hardiness zone 7+. Leaves fragrant in color green leaf can be ovate to elliptic shape. Flower color blue or purple in a dancer shape, the flowers grows in inflorescence on stems. 30 Seeds of Perennial Salvia Mystic Spires - Beautiful spikes of blue flowers covering the entire bush! 1 Perennial Starter of Salvia Mystic Spires - Blue. Beautiful Flower Spikes! 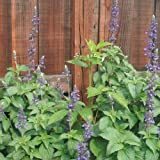 When is the best time to prune a Salvia mystic spires shrub? Dancer shape flowers color blue or purple, the flowers grows in inflorescence on stems.